"I was twenty–three when I came to Grand Bank…My husband was at sea and I only saw him for a month and a half that year… The first thing I asked my husband when I was married was to make a mat frame as I had to do something in the long winter evenings"
In 1944, Belbin opened a confectionary store in Grand Bank where she often hooked mats while sitting behind the counter, continuing her work at home in the evenings during the many months that her husband was away at sea. Belbin's matting work was celebrated in a 1978 solo exhibit at the Memorial University Art Gallery. In the curator's statement Belbin was described as a dedicated and constant worker, even more so after the death of her husband: "After he died, she spent even more time matting, and she now mats every spare moment in her shop when she isn't waiting on friends. She often completes one mat a week, commenting that "work is company." 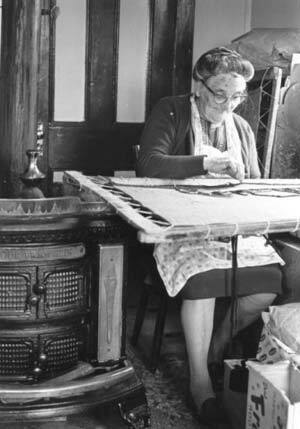 Louise Belbin is still recognized as one of Newfoundland's most prolific mat-makers. Watch a short documentary on Louise Belbin.